One of the things I’m really interested in is how very built-out cities will be able to expand park space for increasingly dense populations. In these cases, cities often turn to the harder spaces like defunct industrial areas, hydro corridors, or out of service rail lines. An idea that hadn’t crossed my mind was to build a park bridge. 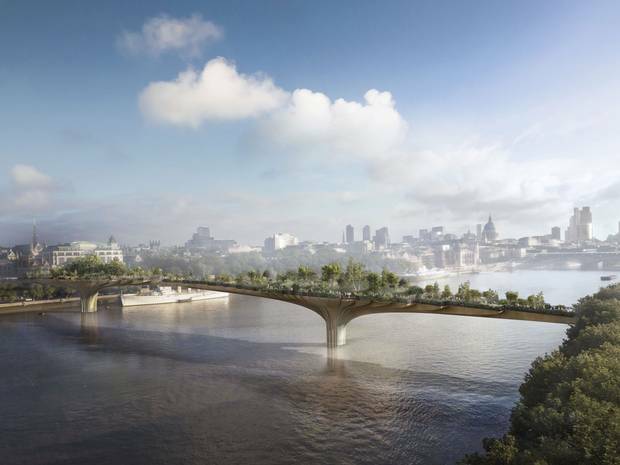 But that is exactly what it seems London may be doing with a new infusion of $30 million pounds announced by the British government for a project that would build a garden bridge over the Thames. With that funding, nearly half of the $150 million pounds needed has been secured. The park bridge also fits into the idea of the park as a new kind of high-design mega-project that cities are increasingly willing to bet their money on in the hopes that it will spur the kind of real estate scramble and tourist stampede that New York’s High Line has done. These mega-parks with their eye-popping designs are certainly attractive—and I think as a form of mega-project to stimulate an area do better than the old idea of plunking down a stadium—but I hope the result is not thinly stretched park budgets that leave these cities struggling to keep up with maintenance. Flashy new parks often come with with flashy designs that are expensive to maintain. And getting rich donors and foundations to pony up for maintenance is much harder than collecting cash for construction. Everyone loves to cut a ribbon after all. I would hope that the fundraising push for any new mega-park like this would also come with an endowment that can fund maintenance for years to come.